In Hinduism, it is believed that a marriage is made in heaven, and once married, the couple’s bond to last for seven lifetimes. Marriage is considered to be a turning point in an individual’s life as they enter into the second important phase or ashram of their life – the ‘Grihasthashram’. Each custom and practice in a Hindu wedding ceremony have pious philosophical and spiritual significance. 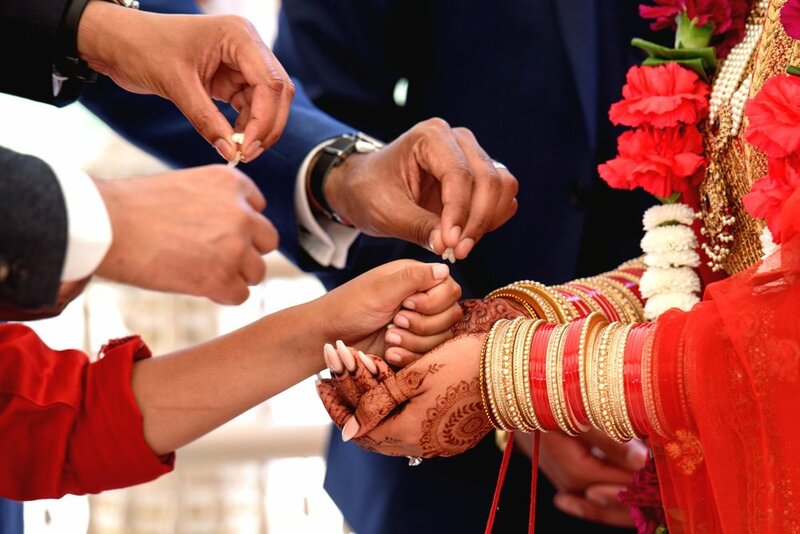 The Consent and satisfaction of the families are of highest importance in Hindu culture as the marriage is not only the union of two souls but also the union of two families, the involvement of the extended family and close friends are integral in Indian Hindu weddings. 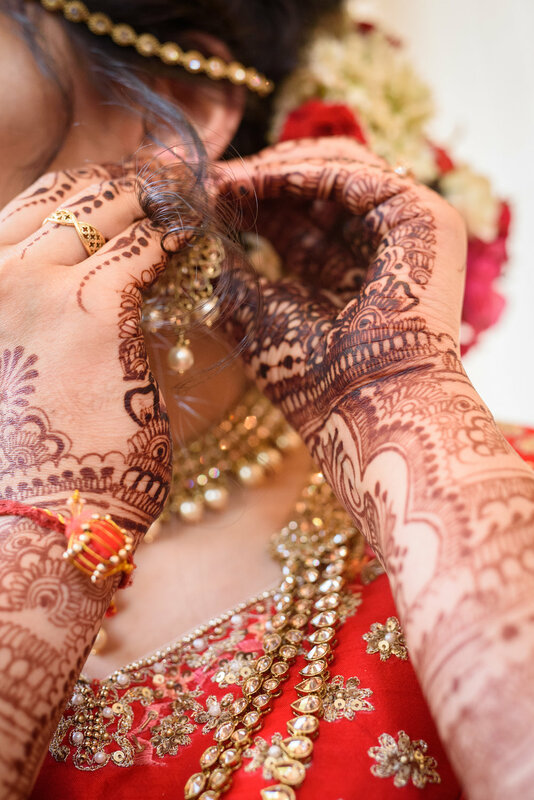 Mehndi is an Indian tradition where a paste is applied on the bride’s and groom’s hands, the bride’s designs are intricate, elaborate and artistic. Henna plant is used to create the thick Mehndi paste, as Mehndi became more popular particularly with people from outside the Indian diaspora it is now often referred to as Henna. Mehndi is considered to bring positive spirits and happiness to the couple legend has it that the darker the colour of the Mehndi the more in love the couple will be. 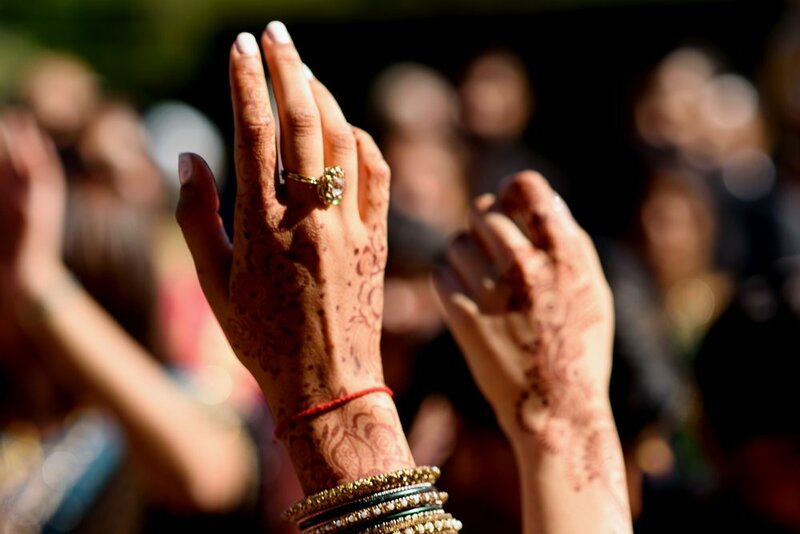 The Mehndi Ceremony is organised and held by the Bride’s family, they invite the female members from both families to gather and have henna designs applied to their hands. The Sangeet is a fun-filled ceremony where both the families get together to perform traditional song-dance routines, and whilst become better aquatinted. The bride’s family will sing folk songs welcoming the groom’s family. Haldi is a ceremony very common amongst a majority of Indian communities. Turmeric is the main ingredient which is ground to a paste along with other ingredients that vary with each culture from East India. The paste is applied to both the bride’s and groom by elderly female members of their families before they are washed with sacred water. The key steps of Hindu wedding ritual are Kanyadaan and Paanigrahan, Vivaah Homa, Laja Homa and Agni Pradakshina, and finally Saptapadi according to Grihya sutras without these important steps the marriage would be considered incomplete. Traditionally, the wedding is hosted by the bride’s parents the groom and his family are their guest at the ceremony. The wedding Mandap is a provisional structure constructed exclusively for marriage ceremony it is held up by four pillars supporting a frame, with royal chairs for the bride and the groom, side chairs for parents and a pedestal for the sacred fire set within it. The Mandap is traditionally made of wood and can be decorated with a variety of items from flowers and greenery to fabric and crystals. The main rituals involved in the wedding ceremonies take place underneath the Mandap. The wedding ceremony portrays the tale of the initial meeting between the bride and the groom at the wedding mandap. The bride’s parents give her away to an admirable man, the couple committing to each other in front of the sacred fire, the couple then take seven vows of commitment to the marriage. They are then bestowed with blessings from families and friends. When the bride arrives at the mandap and the couple lay their eyes on each other. 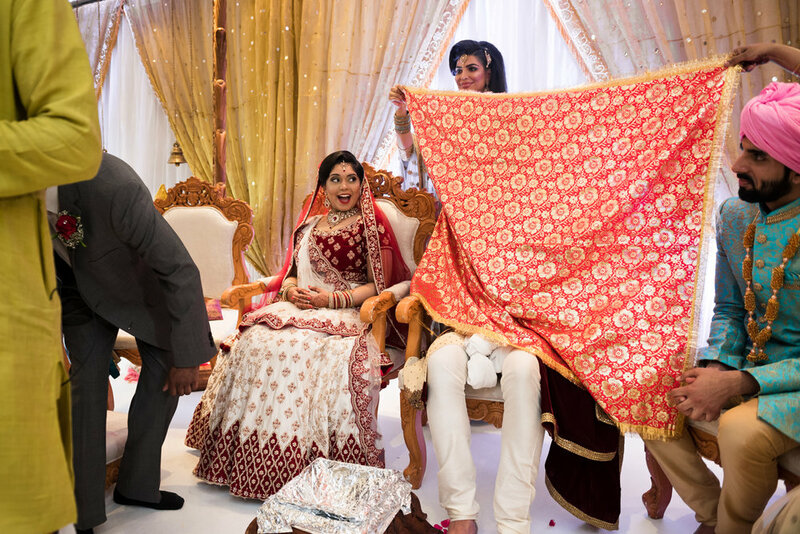 The bride's father gives her away to the groom in a ceremony known as Kanyadaan. Her left hand is placed on the groom’s right hand and the bride’s parents utter the following words while giving her away. 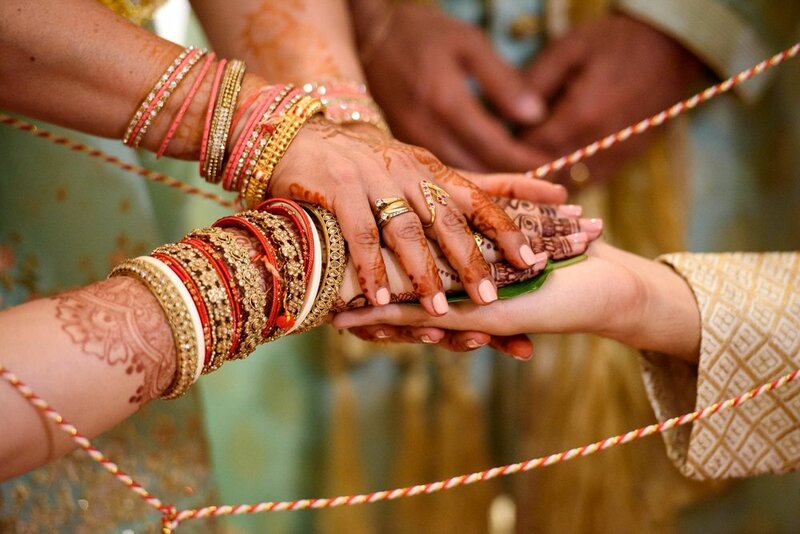 The joining of hands in marriage signals the debt repaid to their forefathers by continuing the next life cycle.’ Kanyadaan is the noblest act of offering a person can perform in doing so the parents of the bride are absolved of all their bad karmas. 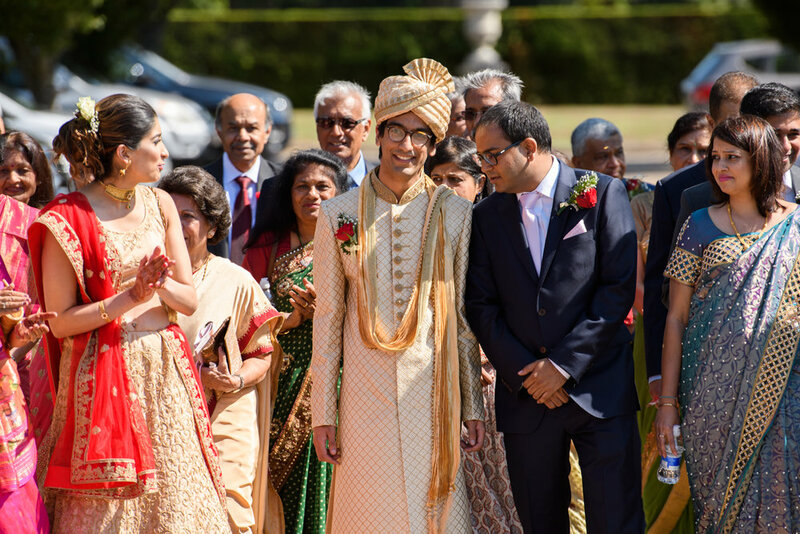 The groom accepts the bride’s hand, they promise each other that as they pursue a life of Dharma, Artha and Kama, they will remain faithful to each other. This is the Paanigrahan. The sacrosanct fire at the centre of the wedding mandap and is seen as the prime witness of the marriage rituals. The couple feed offerings of ghee to the fire as they pray to the Gods for Santati (children), Deergharogya (long and healthy lives) and Sampatti (wealth & prosperity). The Vivaha Homa. As part of the Laja Homa, the bride’s brother pours rice onto her palms for the couple to offer it to the sanctified fire together. The couple’s garments are tied together in a knot at the ends they then perform the Agni Pradakshina. They walk seven circles around the fire pronouncing promises to each other to be eternal partners and match each other in life’s amazing journey. On completion of the seventh circle, the bride steps to the left side of the groom indicating that she is now part of his life. The final and the most important ritual in a Hindu Wedding is the Saptapadi or the Seven Sacred Vows. The bride takes seven steps as she pushes a stone along the floor with her left foot while the groom assists her. The couple repeats their desires for married life as each step denotes a specific promise the bride and groom make to each other. Once the steps have been completed, the marriage is concluded and the couple receives the blessing from the elders of both families. The post-wedding ceremonies mainly involve The Vidaai, the welcoming of the bride at the groom’s home. As she departs her maternal home the bride’s family gives her an emotional send-off as she leaves the bride throws back three handfuls of rice over her shoulders to indicate the end of her debt to her parents for raising her and wishing prosperity upon them. A reception party is organised to feed the guest and for the couple to receive the blessing of everyone in attendance. This normally takes place once all the wedding rituals and formalities have been completed. Over the years we have become specialist Hindu Wedding Photographers. We feel blessed to have photographed some of the most grand, elaborate and beautiful weddings both in the UK and international destinations. Our experience of Hindu Weddings has provided us the opportunity to ascertain knowledge of the ceremonies and the significant rituals to watch for. We will capture all the important and special moments during the wedding, ensuring that the wedding photos, the wedding albums and the overall experience with Sikh & Dread Photography are the pinnacle of luxury Asian wedding photography. Please contact us if you’re interested in hiring us for your wedding.